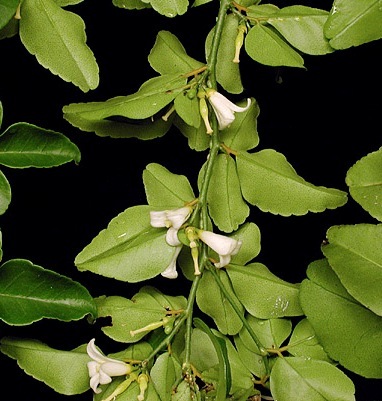 Synonyms: Limonia trifolia, Triphasia aurantiola. Limeberry is a plant from South East Asia. It is a member of citrus family and is believed to have originated in Java, Indonesia. It grows naturally in forests It is grown for its small fruits. Limeberry has now been introduced to many tropical and subtropical regions of the world. 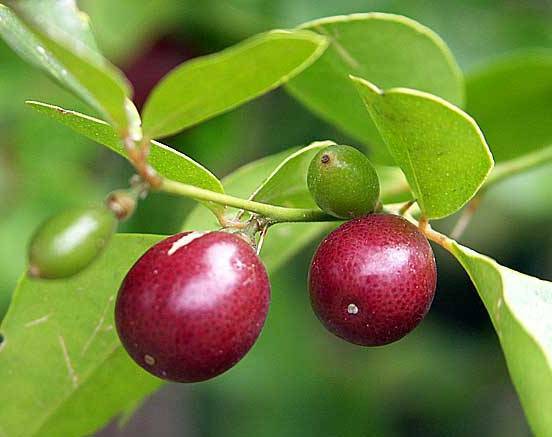 It is now widely cultivated in several in Pacific, Caribbean and Indian ocean countries for its fruits as well as an ornamental plant. 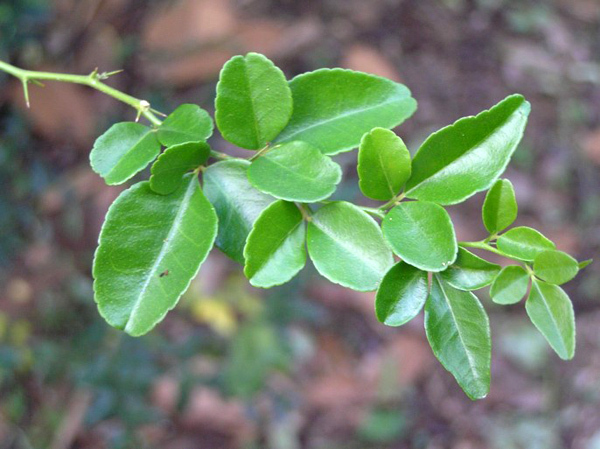 A glabrous shrub or small tree with terete twigs bearing paired spines in the axils of the leaves; upto 3 m tall. Leaves 3-foliolate, the terminal leaflet ovate with a cuneate base and a rounded emarginate tip, 2-4 X 1.5-2 cm; lateral leaflets much smaller than the terminal one (1-2-2 X 0.8-1.2 cm), broadly rounded at the tip, cuneate at the base; petiolules very short (1.5-2 cm); petioles short (3-5 mm), wingless;. Flowers appearing singly or 2 or 3 in the axils of the leaves; peduncles short (3-4 X 1 mm); flower buds cylindrical, 10-12 X 3-4 mm; flowers 3-merous (but with 6 stamens); sepals small (1.5-2 mm long), 3-lobed, green, persistent; petals white, 10-13 X 3.6-4.5 mm; staminal filaments slender, glabrous, 9-11 mm long, anthers oblong, 2 X 1 mm; disk annular or short-cylindric; ovary ovoid or fusiform with 3 locules, each with 1 ovule, narrowed into a slender, deciduous style with a capitate, 3-lobed stigma. Fruit ovoid or subglobose, sometimes apiculate, 1.2-1.5 cm long, dull reddish-orange or crimson when fleshy ripe; peel with many small oil glands; seeds 1-3, immersed in mucilaginous pulpy flesh. 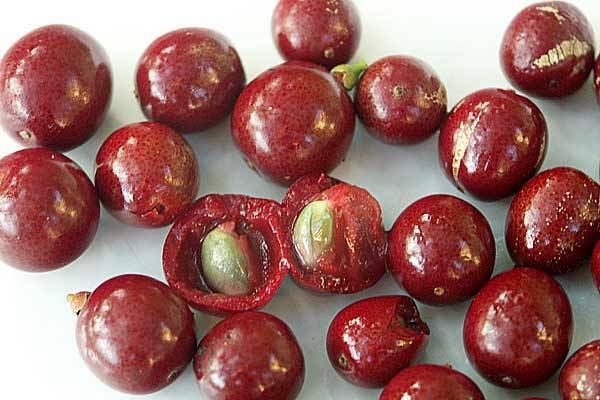 Limeberry fruits are eaten raw. These are also cooked and made into a preserve or candy. The fruits are also used in beverages. 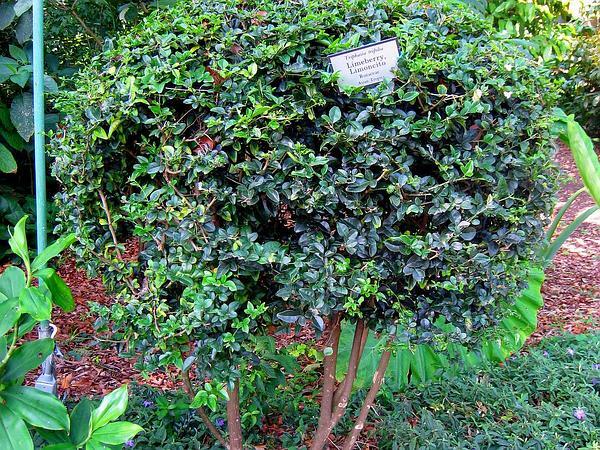 Limeberry is often planted as hedge or as specimen plant in the gardens. It is also quite suitable for growing as bonsai. New plants are raised from seed. The plants can be planted in full or partial sunlight. Grow in full sun to part shade. These will require regular watering. They are not affected by mild cold but would require protection if the winter is too severe and long.